The citations in the following paragraphs are quoted from the English edition translated by W.Y. Evans-Wentz and lama Kazi Dawa-Samdup (the Tibetan Book of the Dead, Oxford University Press). As he is ordinarily, the human being does not realize to what extent, or in what manner, life and death are closely linked. During his whole lifetime, it never occurs to him that, at each moment that passes by, he is in the process of dying. And when the ultimate moment arrives when he has to leave his body, at the beginning — as stated in various mystical treatise — he does not know that he is dead. Habit being very strong, he believes that he still inhabits his physical body. It happens so often, particularly in the West where the intellect dominates, one meets seekers who entertain the vague hope that, because they have understood intellectually what a spiritual teaching consists of, all will be well for them when they leave this world and that they will be able, without doubt, to break the circle of births and deaths and thus attain liberation. In order to understand better what happens at the critical moment of death, when the future destiny of the deceased is at stake, it is necessary to draw a parallel between certain stages of the after-death state, as described in the Tibetan Book of the Dead, and what occurs during meditation. At the very beginning of each one of his meditation sitting, for a very short instant, the aspirant may touch a most particular state of consciousness which gives him the impression of being simple emptiness only, but is, in reality, a state of immaculate consciousness of the highest subtlety and transparency. This state of consciousness which is so unusual and difficult to apprehend, only lasts for two or three seconds at first before being replaced by another state which, although not being his customary state of being, is, nevertheless, no more the same as what he experienced in himself initially. Failing to understand and appreciate the real value of this state of consciousness— which is so alien to him that, at first sight, it gives him the impression of being a vacuum without importance—, the seeker cannot, due to ignorance and lack of practice, find the strength to stay in it. He loses it very quickly and despite his efforts to continue to meditate, he descends to another state of consciousness which is not what he experienced in the beginning. The same phenomenon — but on an entirely different scale — arises in a human being when he leaves his body, a phenomenon of which the implications prove decisive for his future. In other words, as explained in the Bardo Thodol (the Tibetan Book of the Dead), immediately after leaving this world, the deceased is confronted with the Supreme Consciousness in Its original purity. But, failing to apprehend It, he descends to lower and lower levels in himself until he becomes lost in a mental world which manifests itself in the form of a most impressive panorama, spreading out in front of his mind in such a spectacular way that, because of ignorance and lack of discernment, he takes it for being a reality. To be able to remain in this primordial state — which the Bardo Thodol calls either “Clear Light” or “Clear Consciousness” — represents a feat totally out of the ordinary, which can only be the result of long and persistent training, in the form of intense meditation practice as well as other concentration exercises carried out both at home and in outside active life. It is precisely with the help of specific concentration exercises (such as those given in several of my books) which force the aspirant to remain intensely present during their execution that he can start to experience during his daily life moments of very particular self-awareness which come to him suddenly after varying lengths of time of inner absences. These moments of self-awareness are accompanied by the beginning of an inner awakening which he should try, with all his might, to prolong so that the day will eventually come when he will no longer lose it. At these moments, which will determine what his future will be, the seeker should realize that, in the same way he is faced throughout his life with choices to be made in order to be able to remain in this state of being and of consciousness which is not habitual to him, after death all incarnate beings will find themselves in a situation where decisive choices will be demanded of them. In this regard, the Tibetan Book of the Dead continuously emphasizes that the deceased, after leaving his earthly body, will be faced, on several occasions, with two lights or two colors between which he must choose. Unfortunately, owing to ignorance and weakness, he will not be able to hold himself from turning toward that which is the duller. Thus, unless he has devoted himself to a relentless spiritual practice during his life, he will begin to descend helplessly to lower and lower levels of being and of consciousness in himself, without being able to realize what is happening to him. As a reward for all the efforts that an aspirant has made to become detached from himself and remain as concentrated as is possible for him, both during meditation and during specific concentration exercises at different moments of the day, sudden returns of self-awareness will come to him, by Grace, at the most unexpected moments (when he was lost to himself, engulfed once more in his habitual state of hazy absence), in order to awaken him again and remind him of the imperative necessity there is for him to struggle to remain, both in length of time and depth, as present to himself as he can. If, during his life, he does not grasp the importance of the struggle he must make — right throughout his life if necessary — to try to remain in this new state of being and of consciousness when it suddenly arises in him again at various moments during the day, how can he hope not to feel totally at a loss in the face of death when it stands before him at this supreme hour, to end irrevocably his days and drag him away into a world where conditions will be so different from those he has habitually known and which he will not be prepared to confront? He must understand that, in the same way he let pass by and loses these precious moments of return of self-consciousness which arise so unexpectedly in him, preferring, unknowingly to him, to turn towards the states of being which are familiar to him and which require no effort on his part, after death, he will not be able to find in himself the necessary strength to seize the possibilities offered him by the Divine Misericord to free himself from his customary inner world. He will prefer to turn to what is symbolically represented by duller lights or colors, rather than towards those that seem to him clearer and stronger, blinding and troubling him. Thus, he will be unable to avoid gravitating towards undesirable levels of being in himself, becoming prey to phantasmagorical phenomena — in a rather similar way, but at a much more dramatic scale, to that which takes place in him during each of his nightly sleeps while he still inhabits his earthly body. In any case, even whilst alive, a non-enlightened person cannot avoid being prey to each thought, to each desire and to each image which arises in his mind, and of which, by ignorance, he never puts into question the reality. At each instant, he gravitates helplessly to a psychic place which is his alone, in accordance with his desires, his interests and the manner in which he forges himself during the time given to him to live. In order to bring more light on a subject which is determining for the aspirant’s spiritual evolution, it is necessary to return to the importance of this inner battle which he must undertake whilst still alive. If, after all his meditation practice and certain concentration exercises that he has carried out during his active life, he has really come to recognize in himself a state of being and of consciousness totally different than that in which his existence has passed until then, he must realize, from the depths of himself, the value of this new feeling that he has, by Grace, been privileged to experience. From this day onward when an unhoped door has opened for him, he has to struggle with all his might (like a drowning person to whom one has thrown a rope to rescue him) so as to find again this new state of being and of consciousness, and try to maintain himself in it. It is vital for him to understand that to remain in this state, which is still very fragile, is Life, and that the loss of this state is Death. He must appreciate that what has happened to him is the most important event in his life and look at this new state of being in himself with veneration and gratitude without limits. From this moment onward — when a priceless gift has been granted to him — he will find himself placed in situations where he will have to make continual choices between the superior aspect of his being which calls him from within and certain thoughts and desires unprofitable for what he seeks to accomplish in him, so as to succeed not only to stay in this state, but, even more so, to deepen it so as to arrive at understanding that it is truly the beginning of the awakening of which the Buddha spoke. The seeker will see, through repeated experiences, how much this state of awakening in which he tries to maintain himself is fragile. Time and again, during his meditation practices or his spiritual exercises carried out during the whirl of external life, in spite of all his efforts to try to remain inwardly awake, he will not be able to avoid being taken by surprise at first and finding himself dragged down by his customary state of being and of consciousness, sleeping internally and daydreaming. When a person is plunged in his night sleep, he is at the mercy of all the dreams that arise in his mind, whether they are pleasant or nightmarish. When he wakes up in the morning, the fact that he is called again to respond to the various necessities of outer life and the pressing needs of his earthly body, he finds himself, in some way, sheltered from these night dreams which absorb him the whole time that they unfold in his being and against which he is in a situation of total helplessness. However, after death, he will have neither his physical body to occupy himself, nor the incessant claims of external life which generally monopolize all his attention. He will then find himself, exactly as in his night dreams when he was still alive, incapable of controlling the confused wanderings of his mind, descending — depending on his level of being — lower and lower in himself, in a world which will be his alone, full of the most impressive hallucinations, until, as it is said in the Bardo Thodol, he finishes by becoming incarnate again into phenomenal existence. And it is in this way that the round of births and deaths will perpetuate for him. If he aspires to free himself from the prison of his tiny, illusory mental world, the seeker must arrive at recognizing in himself a very particular Void — which, contrary to what the common run of humankind can imagine, is not nothingness, but constitutes, in fact, his Primordial Essence —, so that, after long and tenacious meditation practice as well as spiritual exercises carried out in different life situations, he succeeds to remain in this state after his physical death, without dreading this condition of being in which he is going, inevitably, to find himself at this monumental instant. 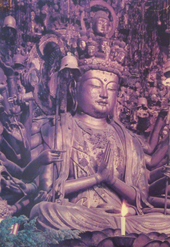 Because of its major importance for the aspirant, it is necessary to return once again to the fact that this Void, or “Shunyata” as it is called in India, consists in fact of a very particular form of consciousness which has no common measure with the ordinary consciousness in which human beings generally pass their life. It is an Immaculate Consciousness of the highest subtlety which constitutes the very Essence of all beings, as well as an inviolable sanctuary in which the seeker can take refuge, not only during the time allowed him to live in this turbulent world, but also after his corporeal death. Physically, it is impossible for him to escape from the force of gravity which, from his birth, has not ceased to be at work, pulling him ever downwards, until the day when, by an inexorable law which governs the whole of the manifest world, he finally loses his body. But, as previously said, he can escape psychically from this descending force — in so much as he dedicates his life to this end. Since this form of existence is destined from the outset to be only temporary, should not one in this case infer that it is precisely what awaits the human being after the dissolution of his earthly body that proves to be the most important thing? At the beginning of his engagement on the spiritual path, when he is still struggling with the initial effort to remain as present to himself and as concentrated as possible during his meditation practice, if the seeker is honest enough with himself and truly seeks to know himself, he cannot fail to notice that, after a certain time, or even from the beginning, he has a hidden desire to stop meditating, and that he is relieved when that moment arrives. And, what is more, he will discover that he is even secretly glad to come back to his habitual conditions of life and to find once again the ease of his customary state of being, his empty daydreams, his usual feeling of himself and his ordinary preoccupations, preferring all that — including the turmoils and the continual worries that this state of being drags in its wake — rather than having to make the necessary effort to remain concentrated and inwardly present during the time that he devotes to his meditation. One can go so far as to say, that, strangely enough, he needs to escape in his external and internal problems in order to fill a gap in him that, otherwise, proves to be too intolerable to bear! He should arrive to see clearly these subtle refusals which arise in him while he tries to meditate (and which generally escape his attention), in order that the reverse attitude can start to take place in him. That is, instead of secretly wishing to finish his meditation practice rapidly in order to go back to whatever is drawing him outwardly and find again the ease of his habitual way of being, he will, on the contrary, arrive at wanting, as soon as he terminates what occupies him externally, to return to his meditation and his other spiritual exercises; failing which, a hidden conflict will always exist in him while he tries to concentrate, and his efforts will not lead him to the desired goal: to know the Princely Aspect of his double nature. He can even end up by being tempted to abandon completely his meditation — as has happened with so many seekers without them understanding the true reason. Nonetheless, what has just been explained should not under any circumstance signify that the aspirant may allow himself to neglect or badly fulfil his external obligations; because, to be able to rise to another plane of being and of consciousness in himself, he must use everything as a means to become more true, more noble and worthy of being united one day with his Celestial Monarch. When, during meditation, the seeker begins to be touched by the radiance of a superior state of consciousness — in which he will feel mysteriously metamorphosed into an enigmatic silent Witness — he will start to recognize, through a tranquil discernment that will have imperceptibly germinated in him, the futility of the ordinary aspect of his nature in which he has spent the greater part of his earthly life. From then on, he will wish to return to this luminous aspect of his being each time he finds himself separated from it. This ineffable state that he experiences at certain privileged moments during his meditation will become for him the sole reality within the conditions of the manifest world which, by its very nature, can only be eternally changing and painful. He will then yearn to be able to maintain himself in this state of consciousness, which is still not habitual to him, during his active life as well. He will have to understand that his evolution to another plane above time and space, and his eventual emancipation depend on what he implants in himself in the present, for he must realize that: evolution signifies recalling (in other words, a mysterious silent memory arises in a human being at a given moment of his existence to impel him to take up again what he has not been able to accomplish in an unfathomable past) and forgetting signifies involution! Furthermore, he must not lose sight of the fact that all manifestation in matter, including the Universe itself, moves towards an inevitable end and that the time allowed to him to reach this goal, so out of the ordinary, is limited! A sincere seeker may have remarked that, at the beginning of his engagement on a spiritual path, not only his agitated mind refused to abandon what was preoccupying him, secretly inciting him to stop meditating in order to return to his ordinary activities, but also that he was using all sorts of arguments or pretexts to justify stopping his meditation and get up — invoking the necessity of having first to attend to all sorts of urgent matters. In fact, what he cannot see in the beginning of this work on himself, is that he was and still remains painfully attached to everything that attracts him from outside — and even, curiously, to unpleasant things. As said previously, a reversal of his feelings and of his way of being during his meditation practices is of extreme importance and should start taking place in him whilst he is still alive; failing which, in the same way that, when he tries to meditate, an aspect of himself refuses to let go of its preoccupations (to which, without realizing it, he is still very attached), at the crucial hour when he will be summoned to leave his corporeal envelope, all his being, all his feelings and all his thoughts will be turned toward the external world to which he will be on the point of, involuntarily, bidding farewell and to which he is so desperately accustomed — since that will be all that he will have known during his life. His attention will be directed with an intense painful nostalgia towards the conditions of life that were familiar to him, towards his unappeased desires and his unrealized dreams, most of which will only be heavy and useless baggage, of no help to him during this long solitary journey for which he will find himself dramatically unprepared. He will then experience an inexplicable fear which will take the form of a refusal to be reabsorbed into this mysterious state of being unknown to him until then; an enigmatic state of the highest ethereal subtlety which will seem to him to be a mysterious disconcerting void, but which, in reality, is his true condition of being, the Source from where he and all living creatures derive their origin. If the seeker wishes his meditation to become what it really should be, that is to say pure in the strictest sense of the term, it is essential that he perceive clearly the instant when this state of luminous consciousness, which is not habitual to him, starts again to become diluted and mixed with his customary state of being. Meditation in its most authentic signification demands the aspirant’s whole vigilance and the greatest sincerity. The effort which he must necessarily make to remain present and conscious of himself, even though firm, must be tranquil and approached with intelligence. In other words, the intensity of this effort must be right so as not to interfere with the eventual action of a higher force that may begin to manifest itself in him to help him. When the aspirant undertakes this work on himself, he will remark that hardly has he touched a higher state in him that his ordinary individuality and his habitual feeling of himself will immediately loom up again, like a tidal wave to engulf him. After patient and persistent efforts, if he can find enough strength to hold to that state which is not habitual to him for longer periods, he will realize yet more clearly how difficult it is to retain the quality of this new consciousness of himself in all its purity for more than a short instant, and in what manner, before he apprehended what has happened to him, this superior aspect of his nature will have begun to be adulterated again and mixed up with his customary state of being and of feeling himself. The seeker will notice that because of the instability of his mind, which has not yet went through sufficient training, the least desire that arises in him, the least image or thought that crosses his mind or even a simple word that appears suddenly in him, is enough to carry him away and make him forget his resolution to remain present inwardly and connected to the luminous aspect of his double nature. He will see that his fall comes from the fact that his interest, which is not yet strong enough, has changed direction, inevitably carrying with it his attention to what attracted it. He will have therefore to acknowledge that he still remains divided between his superior nature (which does not cease to call him inwardly) and the tangible world that continues to exercise too strong a pressure upon him. The suffering of being split between these two worlds will make him realize that, without rigorous practice to master his rebellious mind, he will remain without defences to all that may come to his mind. How much these words, addressed to the deceased, must be considered by the seeker as a precious teaching sent to him by Grace so that, while he is still alive, he can prepare himself for this monumental hour which awaits him! He must realize that it is only by a constant struggle (which may, depending on his level of being, last throughout his life) to remain connected with a completely different state of consciousness in him — a subtle ethereal consciousness with which he ought to be familiar already — that he can hope to remain firm and undistracted at this fateful instant when he is called to leave the sensory world. Fully recognizing this transparency of being and of consciousness as the Source from where he has emerged, is for the aspirant to have found the secret key with which to open the door of the prison in which he is enclosed, so as to be able to free himself one day from the tyranny and slavery of his inferior nature and from duality. From then on, his purification and his deliverance from all the sufferings — which necessarily accompany this form of existence and his ordinary individuality — will have commenced. This major discovery will also signify for him the extraordinary hope of being able finally to conquer death itself — on condition that he understood what death really is. In other words, in what sense it should be considered, in what manner one is ordinarily dying at each instant without realizing it, and which aspect of human nature is subjugated to it!